SOURCE hydration bladders are practically self-cleaning. One of the key reasons: The unique Glass-Like™ Film Technology, which makes the surface of our bladders almost as smooth as glass. To visualize the fact, we had specialists perform microscopic imaging of our bladder’s surface. The surface of our multi-layer Polyethylene film for the SOURCE hydration bladders is almost as smooth as glass. The microscopic detail is one of the key elements for long-lasting taste-free and hygienic storage of liquids. The Glass-Like™ surface prevents bio-film build up, making the system practically self-cleaning. 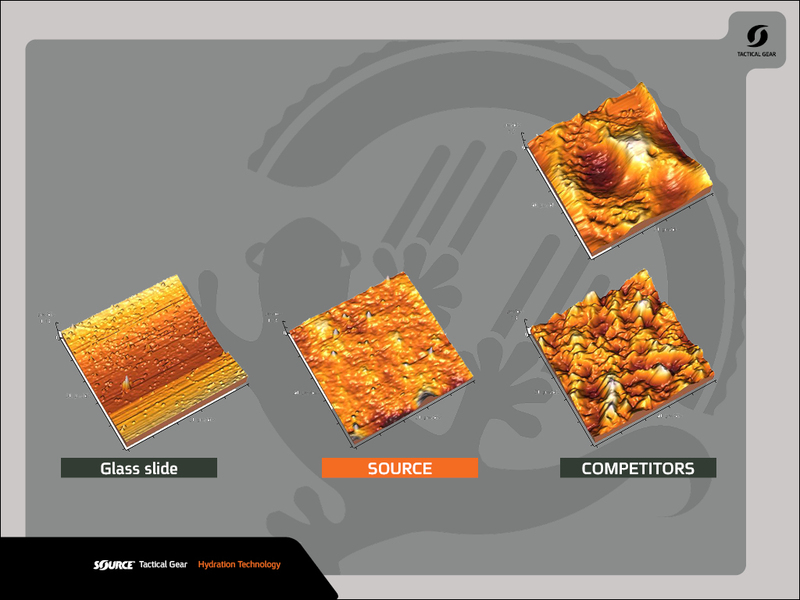 The test shows: SOURCE’s Glass-Like™ Film is 2,000% smoother than standard TPU films. It’s obviously SOURCE – Better by technology.